HOUSTON - Data Projections Inc, a Houston-based company was recognized for their commitment to quality in the workplace by the Better Business Bureau. 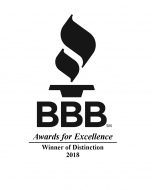 This was the first time Data Projections was named by the BBB as a 2018 Winner of Distinction for excellence. Robby Turner, Executive Vice President said “Data Projections has a long history and reputation for outstanding service for our clients. We work hard to provide each of our clients with that level of service and we are honored to be recognized for our efforts. We serve not only businesses, but work with educators as well to provide the best classroom experience for students,” he added. Founded in 1987, Data Projections has grown into a leader in the audio/visual solutions industry. With offices in Austin, Dallas, Houston and San Antonio, Data Projections focuses on the businesses and institutions that also call Texas home. Data Projections offers its clients the ability to connect with others, collaborate in innovate ways and simplify even the most technically complex processes. Visit www.dataprojections.com to learn more.